WANT TO LEARN HOW TO CARE FOR ORCHIDS? Here is a little mini course in what you need to know about how to care for orchids. In the wild in the orchids grow primarily in trees as epiphytes or air plants. Sometimes they grow in the ground (terrestrials) like many other plants. Those that grow from trees tend to make the best houseplants. Orchid success in your home is simple. Just select the orchids that fit the conditions that you can provide. Ideally you match what makes the orchid thrive in the wild and they will be happy in your home. The primary criteria for orchids are light, temperature, humidity, air circulation, appropriate water, appropriate media and correct fertilizer. Like many other flowering plants, orchids often appreciate relatively bright light. This depends upon the kind of orchid. But as a general rule, you may wish to grow orchids and the brightest area of your home and unobstructed south facing window is ideal. However it may need some shading in the summer months. Many orchids will thrive in east or west facing windows as well. Be sensitive to the particular kind of orchid and just exactly what its light requirements are that will allow it to thrive. 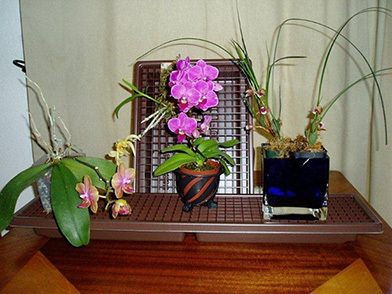 Water is crucial for orchids and different kinds of orchids have different water requirements. The frequency of watering depends on the type of orchid, media, light conditions, container characteristics and temperature. Generally, Cattleyas, Dendrobiums, Encyclias, Epidendrums, and others need to be allowed to dry between watering but others such as Phalaenopsis, Paphiopedilums, Phragmipediums & Miltonias need to stay moderately moist. Watering more is appropriate when the light and temperature is higher, or the humidity is lower. Plants in baskets or on mounted on slabs or sticks generally need more water. Plants in small pots or in clay pots might also need more water. When there is more air circulation (which orchids love) or if the plants have thinner leaves watering more might be appropriate. Watering less is better when there is less light and the temperature is lower or when the humidity is higher. Plants in plastic pots or larger pots can require less water. Watering less might be more appropriate when there is less air circulation or when the plants have thicker leaves. And it is important to remember that some orchids like certain kinds of Dendrobiums require a rest period where they receive no water at all. Again, it is all about the kind of orchid that you are growing. In general, when orchids are actively growing, water once per week and allow them to dry slightly before the next watering. At each watering, apply enough water so that some drains from the bottom of the pot. Never allow orchid plants to it to sit in water for extended time as it will kill the plant. Orchids are not planted in earth, but in fir bark or the shell of a coconut, bark or cork. The kind of water that is used on orchids can also be important. Tap water or well water works fine for some people. Water that has been through a water softener will make the water unsuitable for most orchids. In fact, this excess salt can even kill an orchid. Rainwater can be a good alternative. If you have a larger collection it is best to consider investing in a reverse osmosis system. The price of these systems has been decreasing in recent years as many more people worldwide want more quality drinking water. There are different ways to do this depending on your growing situation. You want the humidity around the orchid plant to be between 40%-70%. In general you want the humidity (along with the temperature) to be lower at night). In the home one of the easiest ways is to fill trays or saucers with gravel or pebbles and put water in them. Put the plant ABOVE NOT IN the water. Make sure to use a non porous container like a plate or saucer if you are putting your plants on a wooden surface or a surface that will be damaged by moisture. My favorite way to accomplish this is to use Humidi-Grow Trays. You can see these plastic trays in the above picture. They come in various sizes and are fitted with a plastic grate that the plants sit on above the water. They can be set on a window sill or table top. Other ways of increasing humidity around the plants is by using hand sprayers of various designs (hand held or larger compressed sprayers) and periodically mist the plants with water. Let me caution you to be careful if you go this route as standing water on plants for long can cause problems. If I do this I always do it before noon. Of course good air circulation helps minimize this problem. Good air circulation is important how to care for orchids. Remember in the wild they like the gentle breezes that can be present where they grow in their natural state. In the home (or in a greenhouse) this can be accomplished by natural breezes from windows or from carefully placing fans so that they provide a gentle breeze. Orchids in the wild, receive nutrients from the breakdown of organic manner carried to them by the rainfall. In a cultivated situation orchids require regular fertilization to grow and flower properly, but too much fertilizer can quickly damage plants. Water-soluble types of fertilizer specifically formulated for orchids are available at most garden centers and are easy to use. Orchids growing in bark require fertilizer with a higher ratio of nitrogen, such as 30-10-10 or 15-5-5. Mounted orchids and those not planted in bark grow well with even formula fertilizer ratios, such as 20-20-20. A "bloom-booster" type formulation can be used in the autumn that has a higher phosphorus formulation (the middle number), such as 10-30-20. Apply soluble fertilizers monthly, according to the rates recommended on the label. A dilute fertilizer solution can be used to water plants weekly during the growing season. Each month, use plain water to rinse any accumulated fertilizer salts out of the pot. After flowering, when the foliage growth stops, reduce water and fertilizer applications until new leaf production starts again. A good rule to start with is to use one quarter to one half of the recommended strength of a balanced 20-20-20 will work just fine. I sometimes change my formulations using a higher Nitrogen fertilizer (for foliage) from August to January and a lower Nitrogen fertilizer (to support flowering) from February through August. In general, do not fertilize as much in the wintertime. In late spring start applying a balanced fertilizer every other watering, using 1/4 the normal concentration. As you learn the needs of the kind of orchids that you grow you may want to fine tune your formula depending on your water quality and the potting media you use. The adage is “weakly, weekly”. That said it is best to fertilize about once a week or two in the spring and summer and reduce it to about once a month when the weather turns cooler. It is also good to flush out the excess salts from the media about once a month. Use pure water for this flushing. It's my particular opinion that the actual kind of fertilizer is not so important. A good balanced fertilizer 20-20-20, 10-10-10 or 7-7-7. This seems to work well most of the time. It is true that orchids cannot actually use the urea that it is contained in some fertilizers. So I tend to avoid these kinds of fertilizer as it is a waste of my money. The problem is not that the urea will hurt the orchids but that the plants cannot use it directly so you may not be getting all the nitrogen to the orchid that you think you are using. You can grow orchids with a urea based fertilizer. However, many people I know have changed to a non-urea based fertilizer. But know that any fertilizer is better than no fertilizer. I would not worry about killing your plants with urea but you may want to change in the future. With orchids it becomes necessary to re-pot from time to time. It is important to use the correct growing media. 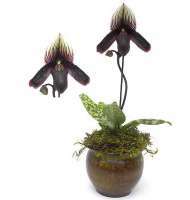 Most orchids are epiphytes and require very different growing media than houseplants. They require a growing media with extremely good aeration and drainage. Commercially prepared orchid potting mixes are available or a mixture can be prepared containing chopped tree fern fiber, volcanic stone, charcoal, a little peat, fir bark or combinations of these. Get a suitable container. The type of container can be either plastic or clay. size the container so the roots fit in the new pot with about one quarter or one half inch extra all around. What's the best potting medium to use? There is no ideal media for all orchids. It will depend on the kind of orchid that you are growing and your individual situation. Personally I mostly work with a fir bark (of various sizes), charcoal, large perlite and red lava rock because it suits what I grow and how I water and my conditions best. However cork bark, coconut chunks or even sticks can work very well. Cork bark and sticks are called mounts and mimic how some orchids grow on trees in the wild. I do grow and re-bloom orchids on mounts and sticks quite successfully. Again it depends on the orchid and its particular cultural needs. And it is good to be aware that different media will need different watering regimes. Orchids are susceptible to a number of insect and disease problems. See this page for information on pests and diseases. I hope this has been helpful in learning How to Care for Orchids! And if you want even more information on caring for orchids then check out this page here.